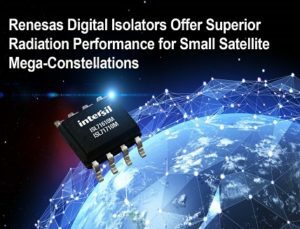 Renesas Electronics Corporation, introduced two plastic packaged, radiation-tolerant digital isolators that provide the highest isolation protection (2,500VRMS) from high voltage spikes in power supply stages and serial communications interfaces used in low Earth orbit (LEO) Small Satellites (SmallSats). Private “New Space” companies plan to launch thousands of SmallSats forming large constellations that operate in multiple LEO planes. SmallSat mega-constellations provide ubiquitous broadband Internet of Things (IoT) communications anywhere across the globe, and Earth observation high-resolution imaging for sea, air, and land asset tracking. 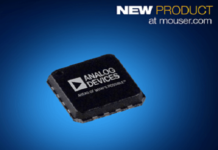 The passive input ISL71610M and active input ISL71710M offer superior performance across key electrical specifications, including isolation voltage, data rate, common mode transient immunity, propagation delay, quiescent current, and dynamic current. 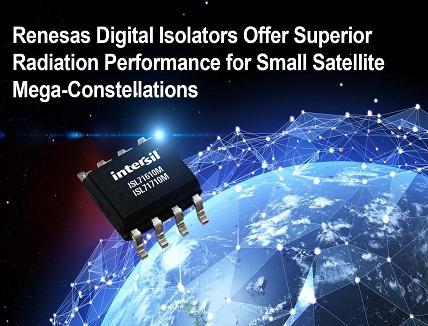 Renesas’ Giant Magneto Resistive (GMR) digital isolators are ideal replacements for optocouplers that are susceptible to cloudy optics from total ionizing dose (TID) radiation. Both GMR isolators also out-perform transformer-based digital isolators that experience electromagnetic interference (EMI) due to radiated emissions from edge and dipole radiation. The Renesas GMR digital isolators are characterization tested at a total ionizing doze (TID) of up to 30krads(Si), and for single event effects (SEE) at a linear energy transfer (LET) of 43MeV•cm2/mg. In isolation partitioned power supply designs, the ISL71610M and ISL71710M provide an instantaneous 2.5kVRMS of isolation and 600VRMS continuous working voltage at 85°C. In serial communications subsystems that need the transmitter and receiver electrically isolated from each other, the ISL71610M operates up to 100 Mbps, and the ISL71710M up to 150 Mbps. 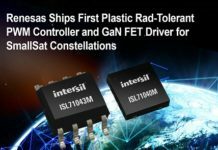 Both offer the New Space industry’s highest data rates–6x higher than competitive solutions–which make them ideal for serial communications links, such as RS-422, RS-485, and Controller Area Network (CAN). The ISL71610M and ISL71710M both have significantly lower quiescent current than the competition, and the ISL71710M has nearly 4x lower dynamic current than Class V isolators. 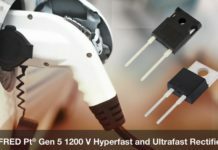 The ISL71610M passive input digital isolator is used in Renesas’ radiation-hardened half-bridge power stage reference design. The reference design’s ISL73040SEH4Z evaluation board demonstrates a half-bridge power stage design capable of taking 100V input from a satellite’s solar panels and generating step-down power rail voltages–28V, 12V, 5V, and 3.3V–with a power efficiency of up to 94 percent. The ISL73040SEHEV4Z User Manual describes how to build a half bridge power stage with isolation using the ISL71610M, ISL73040SEH low side GaN driver and the ISL73024SEH 200V GaN FET. 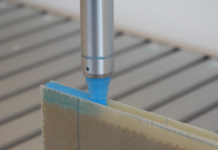 The user manual provides the bill of materials (BOM), and explains how to power the isolator and achieve dead-time control, and it includes layout guidelines to minimize overshoot and ringing on the GaN FET gate. 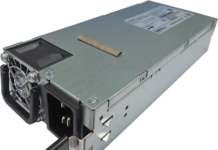 The ISL71710M can be used with a single-ended CAN Bus input signal to provide fault tolerant serial communications isolation between the CAN Bus controller and ISL71026M rad-tolerant CAN Bus transceiver, or the ISL72026SEH rad-hard CAN Bus transceiver. This application can be extended to RS-422 by using the ISL71710 with the HS-26C31 rad-hard RS-422 transmitter and HS-26C32 rad-hard RS-422 receiver. 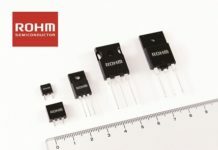 The ISL71610M and ISL71710M radiation-tolerant digital isolators are available now in 8-lead 5mm x 4mm SOIC packages. The passive input ISL71610M is priced at $61.53 USD, and the active input ISL71710M is priced at $64.18 USD, both in 1,000-unit quantities.